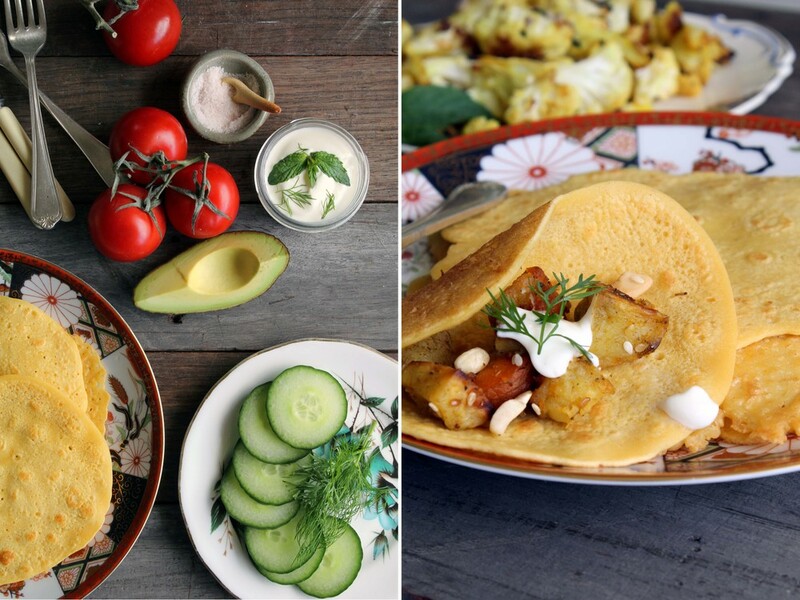 These gluten free chickpea flour flatbreads are super versatile and really delicious. They can be folded and used like soft tacos or crepes, dipped into soups or seasoned well and sit alongside a lunch or dinner salad. The incredible nutty flavour of the chickpea flour works really well with hot smoked paprika but you could play around and use cumin, garlic, fresh or dried herbs or chilli. We enjoyed them tonight for dinner with za'atar roasted vegetables, turmeric cauliflower, minted yoghurt and salad. It was perfection. This recipe is a play on a traditional French flatbread from Nice called Socca. Usually this bread / savoury pancake is grilled until blistered or cooked in a pizza oven. I've played around and find this crepe-like appropriation works best for me. We'll be eating these flatbreads well into Winter. They are perfect for shared, eat-with-your-hands style meals - our favourite kind! Combine ingredients and beat well until the batter is smooth. Let the batter sit for at least half an hour and up to 2 hours. Heat a cast iron skillet or a frying pan on a medium heat. Melt a tablespoon of oil in the pan. Use 1/4 cup portions of batter. Make your flatbreads one at a time. The first side will need a few minutes. Flip and cook for a further minute or two. If your batter is bubbling madly when you pour it in to the pan, turn the heat down slightly. You want your flatbread to be able to able to cook for a few minutes without burning. Your flatbread may come out a little crispy. To ensure it can be folded, simply stack your flatbreads on top of each other as they come out of the pan. The steam will soften them and make them more pliable. These need to be served warm so stack finished flatbreads on a plate in a warm oven while you cook the batch.